Special Black on Black version. Tap 3 area to open UColor selector to cycle dim mode lume color. 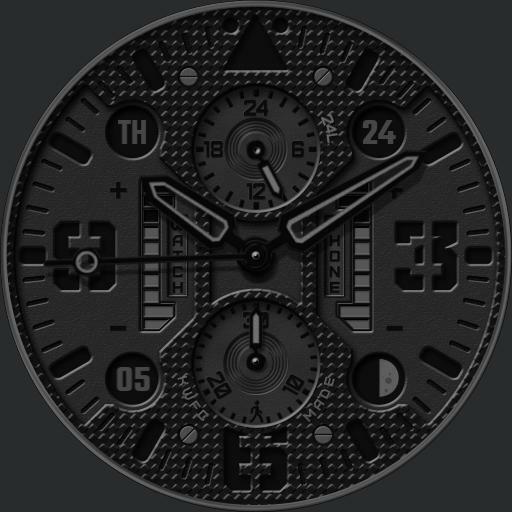 Tap 24 hour sub dial area to cycle 24 hour hand modes = 24 hour local, UTC, TZ1, TZ2, TZ3 and Compass. Tap between 7 and 8 to enter chrono mode and start/stop chrono. Tap between 4 and 5 to exit and reset. In chrono mode seconds hand is chrono seconds, top dial is chrono hours and bottom dial is chrono minutes. Tap 9 area to switch between Month and Heart Rate on lower left window.